The 10 oz Silver Magnificent Maple Leaves Coin from the Royal Canadian Mint certainly lives up to its name. A magnificent 10 troy ounces of .9999 silver in each coin and a superbly detailed design featuring the leaves of the sugar maple, a symbol of Canada that’s recognised all over the world. Each 10 oz Canadian Maple Leaf also features the mint’s world-famous security features and micro-engraving technology. These unique security features were developed by the Royal Canadian Mint and first added to its iconic Silver Maple Leaf Coins in 2014. The complex radial design and micro-engraved laser mark is now a permanent feature of the Mint’s signature bullion coin. The Magnificent Maple Leaves coin is the first 10-ounce Maple Leaf since the 10th anniversary edition in 1998. This beautiful new coin is of equal appeal to collectors and investors thanks to its size, purity and classic design. The sugar maple leaf motif has changed very little since the RCM first introduced its Gold Maple Leaf series in 1979 followed by Silver Maples in 1988. Its intricate lines and intense level of detail have made it one of the bullion world’s most admired designs. The sugar maple leaf has been a symbol of Canada and its people since the start of the 18th century. It is recognised in even the remotest parts of the world and is used on the country’s flag, the uniforms of its Olympic athletes and, of course, its coinage. 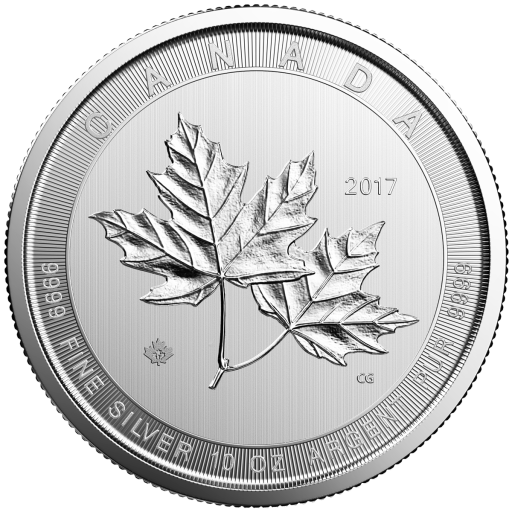 For the 10 oz Maple Leaf Silver Coin, the mint has chosen a pair of maple leaves rather than the single leaf featured on regular editions. Why buy the 10z Canadian Silver Maple Leaf? This special edition coin measures 76.25 mm in diameter making it a spectacular addition to any collection. At ten ounces, it’s also a great way for investors to add substantial amounts of fine silver to their portfolios. CoinInvest is delighted to offer its customers the 10 oz Magnificent Maple Leaves Silver Coin. Why not add some of our coin collector’s gloves to your order? They’ll help to keep your Silver Maple Leaf 10 oz Coin in pristine condition.